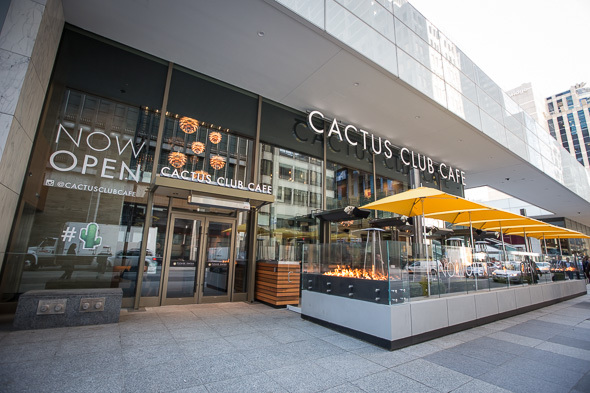 Cactus Club Cafe is a chain out of the West Coast that's been in business almost 30 years and has only just landed in Toronto with a new multi-storey, 500-seat restaurant situated in the heart of the Financial District in First Canadian Place. The decor is as polished as one might expect from a high budget, corporate-owned restaurant, but one thing I was surprised and delighted to discover was the serious collection of artwork that adorns the walls. 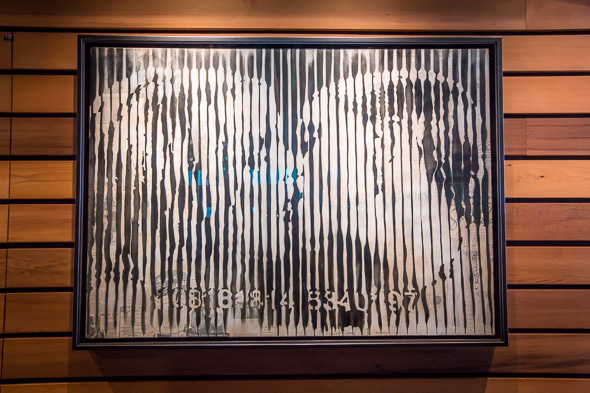 Commissioned pieces from Mr. Brainwash and curated works from Warhol are highlights, and I'd argue that the deep booths under a trio of Basquiat paintings are premium tables. 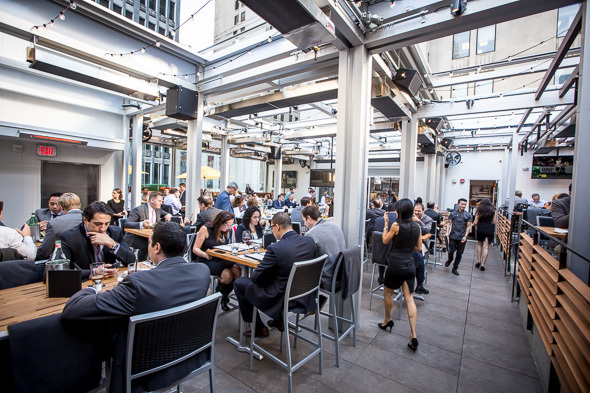 A retractable roof on the third floor will have business lunches on the patio become a year-round thing. This level is equipped not just with its own bar but it's own kitchen too. The corporate chef is none other than TV celeb, Iron Chef champion, and homegrown Vancouver talent himself Rob Feenie. He was brought on eight years ago and while I personally can't compare the pre-Feenie days to the existing incarnation of the Cactus Club, I'm told by someone who can that the chain used to be kind of Jack Astors-ish but has since grown up to become something much more accomplished and sophisticated. 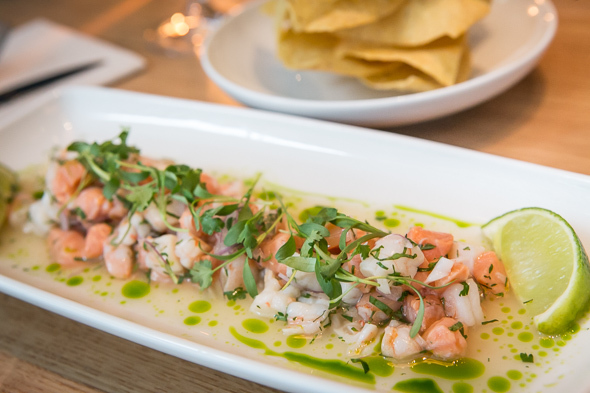 The chain is not identical from location to location but signature dishes like the steelhead and prawn ceviche ($16) and albacore tuna tataki ($15.25) are mainstays. 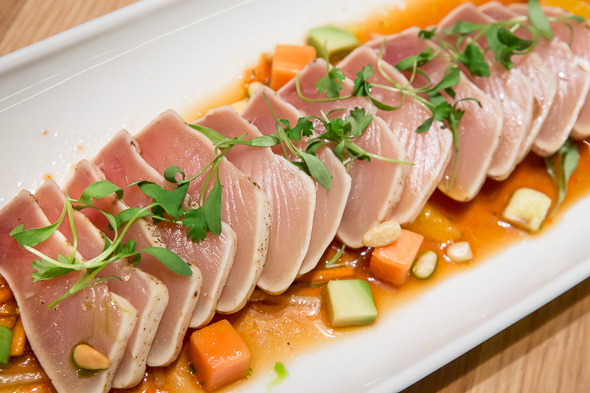 It's worth mentioning that Cactus Club was one of the founding partners of the Ocean Wise program helmed by the Vancouver Aquarium which should instill confidence in the quality and sustainability of the seafood served. 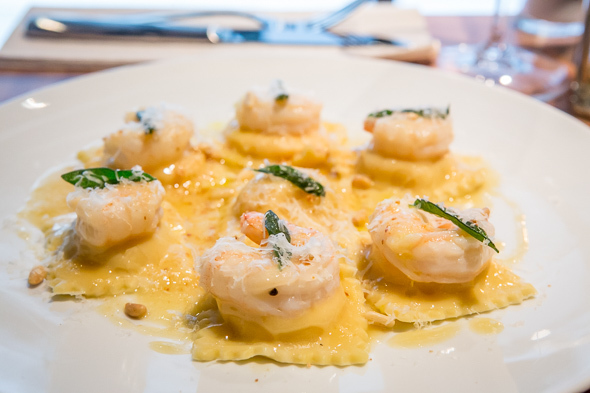 Butternut squash ravioli with prawns ($25.75) is another staple and just one taste and I fully understand why they dare not take it off the menu. The filling is blended with rich and creamy mascarpone and sauced with a truffle-infused beurre blanc. 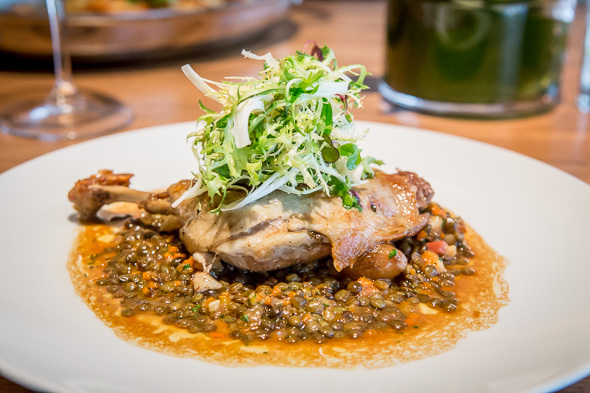 Unique to the Toronto location is the Duck Confit ($25 for a single leg, or +$9 two) that sits over a bed of Puy lentils and is served with caramelized pearl onions and a frisĂŠe salad. It's a nicely balanced dish complemented by a sweet and tangy gastrique that cuts through the richness of the duck. 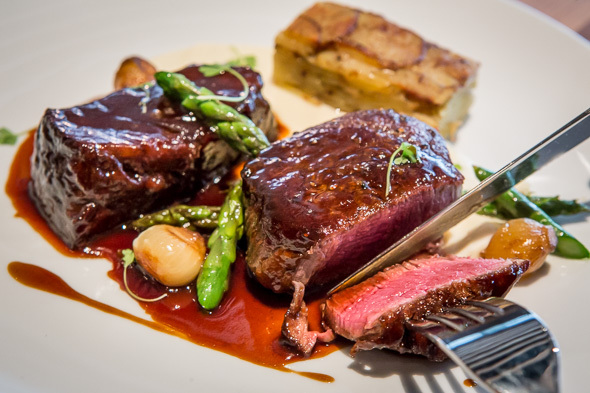 The Cactus Club is the kind of place where you're just as likely to see steaks and premium seafood slumming it on the same table as burgers. It's a big menu that's meant to please a wide variety of tastes and moods. 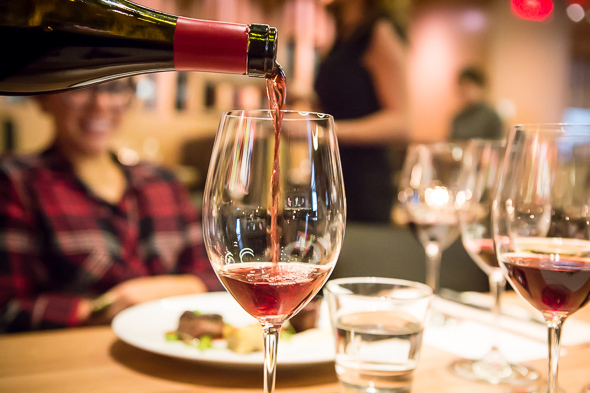 The extensive wine list assembled by sommelier Sebastien Le Goff offers a range of plenty of range for both palettes and budgets (by the glass selections start at $9). Most impressive is the fact that they'll open any bottle on the reserve list so long as guests order a minimum of two glasses. 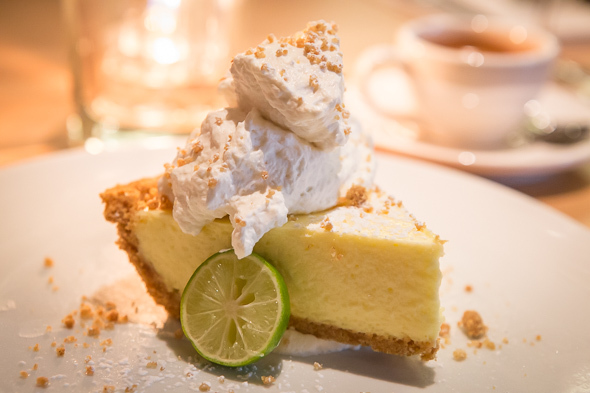 Key lime pie ($8.25) for dessert is a slice of tri-layered graham cracker, tart lime custard and whipped cream peaks. It's an impressive way to end a meal that lives up to the hype. One final thing to note: on weekends, expect the kitchen at The Cactus Club to keep cooking until 1:30am.